For a person who loves food, I don’t particularly love cooking. It’s not a chore I hate and will cook about twice a week, but all the steps leading up to actually preparing the meal (grocery shopping and prep work) seems to take so much time. Meal kit delivery companies help reduce the effort, but may not be the optimal choice for people who like to create – after all, cooking is an art form combining ingredients to create something new. A company that delivers groceries can help save time and effort. Hence, when I was approached by Maillard, a Canadian company supplying premium meats across the country, to experience a selection of their offerings, my inner carnivore did a happy dance. Maillard prides themselves by offering meat free of artificial colouring – those vibrantly red steaks you can see in grocery markets may not necessarily be natural. 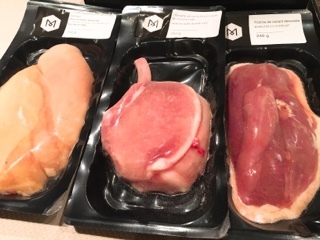 Moreover, except for the flattened chicken, everything is prepared and flash frozen in their facilities before being shipped as quickly as possible to ensure fresh products. Meat is sent in an isotherm cooler packed with dry ice keeping products frozen for 30 hours – it’s quite a scene as you open cardboard box, lift the bags of dry ice and the smoke billows out (just take care not to touch the dry ice). 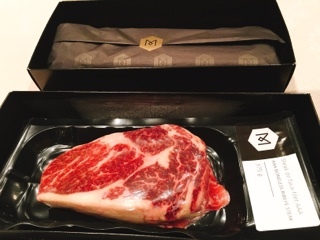 Everything arrives separated and beautifully wrapped … a gift idea for any meat lover in your life. My first dinner consisted of the flattened chicken ($21.24). 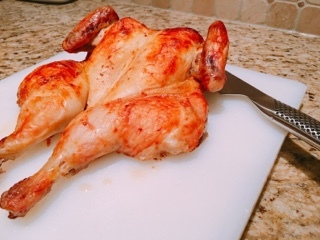 Since it was fully prepared, my finishing touch was simply to marinate it in peri peri (a recipe is available on Maillard’s website, but I just used a bottle of Nando’s sauce) and bake the bird following the requisite time included on the packaging. It resulted in a lovely golden juicy chicken that cooked surprisingly fast (45 minutes) since it was flattened. 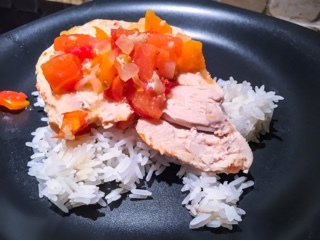 Using the trimmed boneless chicken breasts ($9.10 for pack of two), I whipped up a quick Cajun chicken for a weeknight meal. Even after fileting them (for a shorter cooking time), the chicken came out surprisingly moist. 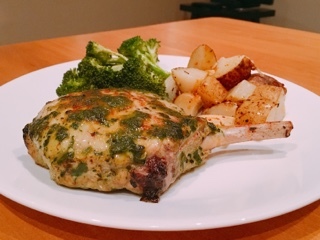 Recipes suggest brining the Frenched bone-in pork chop ($6) prior to cooking as the meat is relatively lean and tends to dry out. Despite every intention to follow the advice, life took over and that evening I ended up slathering on an herb meat glaze and baking. 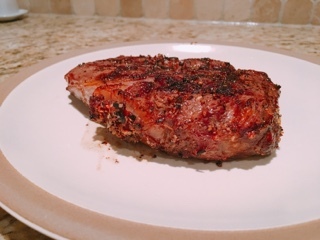 Trust me, you don’t need to spend the extra time brining; the pork chop turned out succulent and one of best I’ve ever prepared. Since a boneless duck breast ($10.15) was included in the package, I expanded my cooking repertoire at home. Surprisingly, it wasn’t too difficult to prepare – you score the fat, slowly render skin side down in a pan, and finish off in a hot oven with a swish of maple syrup. In my haste to taste the duck I forgot to take a picture of the finished product. Next time, I’d definitely render the skin longer as there was still a bit of chewiness, but the duck meat was delicious and the quality comparable to restaurants. If there are specific meats and cuts you’d like, items can be purchased on its own. For better value try their boxes containing 10-40 servings reducing the price per portion and providing variety. 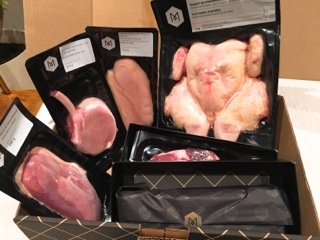 One like the ‘All Natural Box’ is $175 and includes steaks, ground beef, pork chop, pork tenderloin, chicken breast, chicken legs & drumsticks, and marinated chicken skewers, all together serving 40 portions. 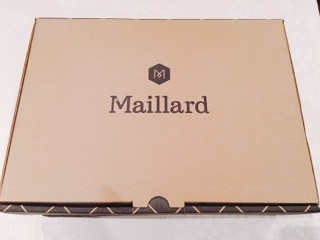 For those who love great luxurious meats and also want to save time, having Maillard delivery a box to your house may be an ideal treat. And for those who still love to great creative - hopefully, Maillard will let out your inner ‘artist’ so you can transform ingredients and develop a beautiful and delicious dish. As a special for Gastro World readers, Maillard is offering you 10% off orders $50+ and free shipping! Just use promo code gastro10 on their website. Disclaimer: The above meat delivery was complimentary. Rest assured, as noted in my mission statement, I will always provide an honest opinion.